Perfect for endurance competitors, trail riders, and others who want to camp for a short time with their horses. All Legend Weekenders are semi-custom, allowing for specific selection of many options, and carry a five year frame warranty and ten year pro-rated warranty on plank walls. Legend Weekenders are built with Jamcos double-thick interlocking plank walls on the lower half and Legend light-wall interlocking planks on the upper half. Legend Weekenders are shipped from the manufacturer with the dressing room as an empty shell. 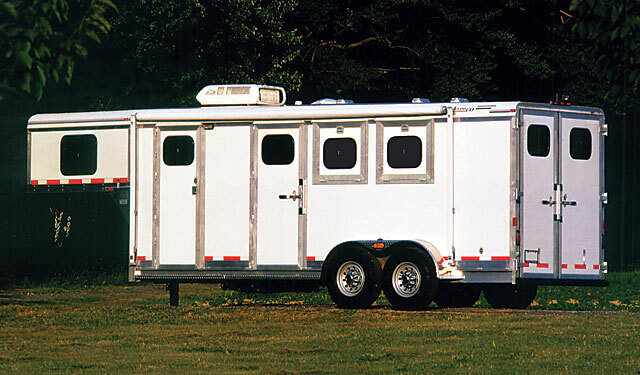 Your local dealer will work with you to have your Legend Weekender completed into a custom mini living quarters. You can expect to fit a small refrigerator, commode shower and sink, sleeping area, and small seating area.